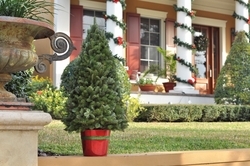 Welcome to our Holiday Greenery page. We offer a variety of beautiful decorations to make your home more jolly and warm for the Holidays! We have created a wide selection of wreaths, garland, mantel pieces, centerpieces & other decor to make your home or event more festive for the season! Click on the links below to browse our selection of beautiful, fresh decorations. We aim to win you over with excellent customer service, competitive prices and high-quality greenery.